Pastor James Eric Williams is a native of Americus, Georgia. He was born into the Body of Christ in 2004. His motivation, ability to teach the living Word of God and bible-inspired way of ministering the Gospel to God’s people captivates people of all ages. He is married to Gigi Williams of Lexington, South Carolina. He is actively involved in Men’s Ministry (Men Of Valor). He partners with his “wife for life” in educating Teens and Single Adults in the program they founded, “Operation Abstinence”. He is a 2009 graduate of the Sonship School Of The Firstborn under the leadership of his Spiritual Father, Apostle/Bishop Nate Holcomb (Founder and Bishop of the Christian House of Prayer, Killeen &Copperas Cove Texas. Founder of Covenant Connections International, (CCI). Pastor Williams is currently attending Liberty University and pursuing a degree in Theology. He has ministered the Word of God in Mosul, Iraq ; Seoul, South Korea; Beijing, China and in the United States. He presently serves in the United States Army as the First Sergeant for United States Army Garrison-Hawaii, Headquarters & Headquarters Detachment at Schofield Barracks, Hawaii, but first and foremost, he is a soldier in the “Army of the Lord”! His love for God illuminates and radiates with an Agape’ love for God’s people. It enthralls those saved and unsaved to thirst for the Word of God! He is known as the preacher that does not “sugarcoat or water down God’s Word”! Pastor Williams lives for HIM, Serves HIM and Knows “It’s All About HIM! 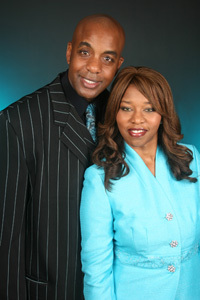 Co-Pastor & First Lady Gigi L. Williams is a native of Lexington, South Carolina. She is the wife of Pastor James E. Williams, mother of three sons, Marcus (currently serving in the U.S. Navy), Marquis and D’andre. She has served in several ministries as an exemplary leader, and as an example of a Proverbs 31 Virtuous Woman. Co-Pastor & First Lady Gigi holds a Bachelor of Science in Nursing Degree, a Masters Social Work Degree and is a NAADAC Substance Abuse Professional. She is a 2009 graduate of the Sonship School of The Firstborn in Killeen, Texas under the leadership of our beloved Apostle Nate Holcomb, Founder Christian House Of Prayer(Killeen & Copperas Cove, TX and Covenant Connections International(CCI). She is the spiritual daughter of Pastor Valerie I. Holcomb, wife of Apostle Nate Holcomb. She is the CEO and Founder of the Markecia Kuuipolani Memorial Foundation and Princess Kuuipolani Christian Cotillion. Co-Pastor is the author of The Quiet Spirit, a bible study for women. She ministers the Word of God with boldness and authority for the furtherance of the Gospel! She is a psalmist and liturgical praise dancer. Pastor Gigi uses her “terminal” status given by physical doctors as fuel to minister the Word of God to show that HE is Jehovah Rapha, HE is the ultimate Physician and HE is the Author & Finisher of Her Faith!